The second edition of South Africa’s very own AAC Resource Manual (2015) with the new 2017 Addendum is now available for purchase. If you are working with individuals with little or no functional speech (LNFS) or complex communication needs (CCN), then this manual is just for you. More than a hundred topics, written by South Africans who are involved with and work with individuals who are in need of AAC, are covered in the manual. Practical guidelines are provided and are aimed at assisting therapists, teachers and families who work and live with these individuals on a daily basis. The 2017 Addendum has been added to reflect some of the latest developments and areas of interest in the practice of AAC in South Africa. It has a wealth of practical ideas and information to offer everyone involved in the AAC field. Some of the topics addressed in the addendum include visual scene displays, Pragmatic organisation dynamic displays (PODD), message banking and partner assisted scanning, just to name a few. The AAC Resource Manual is for the first time available online / electronically. 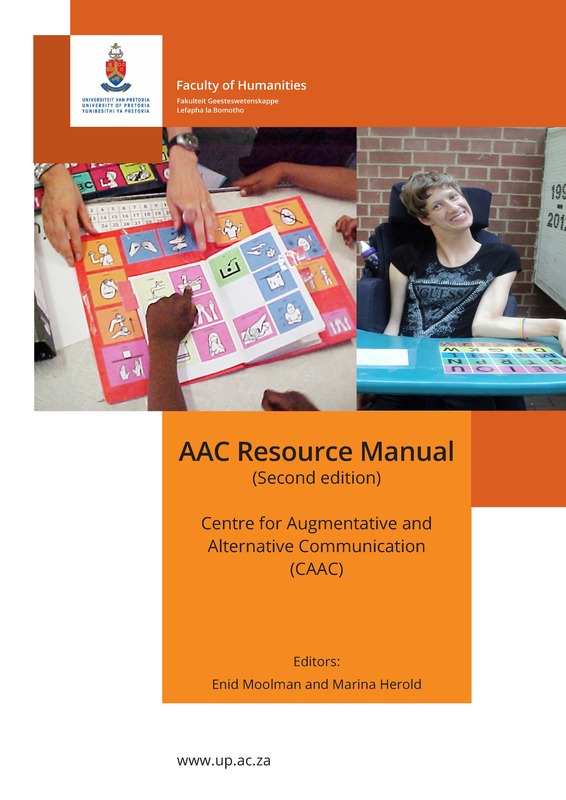 Orders for the AAC Resource Manual can be made from the Centre for Augmentative and Alternative Communication (CAAC) at the University of Pretoria. This email will contain a unique downloadable link, meaning that it can only be downloaded once. So please make sure that you download the AAC Resource Manual to the device on which you would like to keep a copy. Click on the link provided to download these items. The files will then be downloaded to your computer. Please be patient as it may take a while. Proof of the download will be sent to the CAAC for our records. If you experience any difficulties, please do not hesitate to contact us. For more information on the AAC Resource Manual and Addendum 2017, please contact Enid Moolman at [email protected].